Lyrical Venus » Adrina Thorpe – A Whole Latte Musical Inspiration! 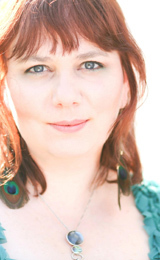 07.08Adrina Thorpe – A Whole Latte Musical Inspiration! Back when I joined MySpace in Sept 2006, one of the first musicians to find me was Adrina Thorpe. With 14 out of her 20 influences already in my music collection (Sarah McLachlan, Tori Amos, Jewel, Coldplay, Michelle Branch, Avril Lavigne, Alanis Morissette and Norah Jones to name a few) I figured there was a pretty good chance of me liking Adrina’s music, and I do! Her soothing piano pop has catchy hooks, soaring vocals and relatable lyrics. She even has a fun remix that reminds me of the stuff on Sarah McLachlin’s Bloom . The other thing I like about Adrina is she’s doing everything on her own and making it work as an independent musician! By keeping up with her bulletins and blog entries I’ve gotten to see her process. I’ve loved watching her grow and try new things. I love how she is a genuinely good person who asks her fans for feedback and actually writes back to them. It’s fun to be part of her climb/journey to wider exposure and making it as a musician. Right now she is in the process of gathering funds to record her next album and has started a new MySpace page with that as the focus. Have a listen to some songs for free on her original page and if you like what you hear, pop over to her album fund page and “buy her a latte”, cuz if all her fans did that, she’d have enough to cover the recording costs in no time! It’s amazing what a little bit can do. Make mine a venti! Thanks Bill, those are some nice videos! !